Note: Please bring lunch, three liters of water, a backpack and snacks. Please wear hiking books and weather-appropriate clothing (bring an extra layer for the high ridge). This is a Moderate hike. This intensity level will push you with a faster pace and longer distances. This hard work allows you to see more terrain and higher vistas. You will be active for five to eight hours. Prepare for this trip by maintaining your daily fitness regime that includes both cardio and strength. A full refund less a 5% credit card fee will be given only if cancellation notice is provided at least two weeks prior to your scheduled activity. If cancellation notice is provided between two weeks and one week prior to your scheduled activity, a full credit will be provided. A full credit less a $30/person rescheduling fee will be given for rescheduling notice provided between one week prior and 3pm on the Thursday before the scheduled activity date. No refunds or credit will be given for cancellations after 3pm on the the Thursday before your scheduled activity date. I've gone on two rock climbing trips with these guys, the 12 mile kayak trip and participated in some of their Women in the Outdoors Week activities. 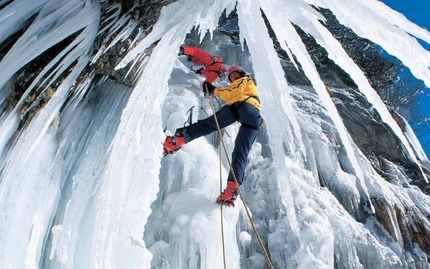 I just signed up for another climbing trip, and am amped to try ice climbing when they offer it again in the winter. Discover Outdoors makes the trips super easy--the transportation is great, the guides are super supportive and fun, and the companies they partner with to provide gear and support have all been really terrific. I had tried signing up with several other outfitters in the city, only to have trips cancelled last minute--Discover Outdoors has always provided really great, reliable service. 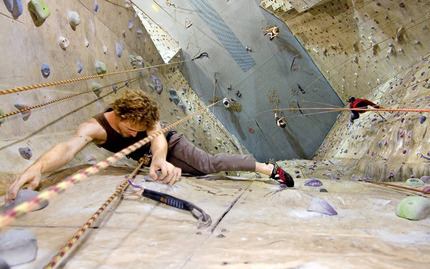 I only wish they offered more rock climbing trips. The season is relatively short, and, right now, they only offer once a month which means that if you can't make that date, no climbing that month (a couple of people on my last trip indicated they would sign up for more, if available). Also, it might totally not be doable, but it would be really cool if at some point they could offer sliding scale pricing on one or two trips. I know plenty of people who would love to participate in one of these trips, but at the current price point, aren't able to. I had a great experience on the Monastery & Meditation Hike. We went to the Fahnestock State Park and visited the Chuang Yen Monastery. The hike was really relaxing and since I am not a hiker, I was a little worried that I wouldn't be able to keep up however, the hike was a good pace and I felt comfortable. After the visit to monastery, we went to the town of Cold Springs. It was beautiful, we had sometime to walk around and grab a bite to eat before returning back to the city. Our hike leader was Alexis, she was super awesome and had a lot of knowledge about hiking which is really helpful for a novice like me. Overall it was a great experience. Yesterday I went on the Buddhist monastery tour and hike. It was amazing!! Perfect way to spend a Sunday. Chris was our guide. He was one of the best parts of the trip. Patient, friendly and knowledgeable. He taught us about the monastery as well as the trail and was prepared when it started raining. We even had a great time hiking in the drizzle!! Overall an amazing experience. Thanks to Chris and all my fellow hikers!! We did the Fourteen Peaks Hike and it was OUTSTANDING! Our guides Lydia and Eric were super attentive, professional and made it so enjoyable. We did a challenging 12 miles and they helped people who wanted to end before and also Eric took care of the ones that wanted to finish the entire thing. Great service, professionals all the way. Love DO! Thank you! I've been on 5 Catskills and Hudson Valley hiking day trips and one 3-day/2-night trip for a winter summit of Mt. Marcy in the Adirondacks. DO has made getting outside wonderfully accessible since I moved to NYC a year and a half ago and gave up my car. The guides are always professional, easy-going, and a pleasure to be around and they know their stuff. I've done most trips with a few of my friends, but I've also met some great new friends through DO trips. It's a testament to DO that I see many of the same people trip after trip. Beyond the professionalism and great array of trip offerings for every skill level, supporting to DO is particularly meaningful because of the work that the Discover Outdoors Foundation does to get kids outside, learning new skills, and developing a comfort level and experience with the outdoors that isn't always available to kids in the city. If you're missing opportunities to do some serious hiking or are a beginner looking to increase your comfort level with hiking and other outdoor activities, DO trips aregreat way to do so. This was my first hike with DO and I had a great experience! I found everyone to be friendly and Christopher was an excellent guide. It was my first time hiking in micro spikes and snowshoes. DO and the assigned guide definitely prepare you in terms of what to pack for the expected conditions. I've since booked three other hikes with DO. 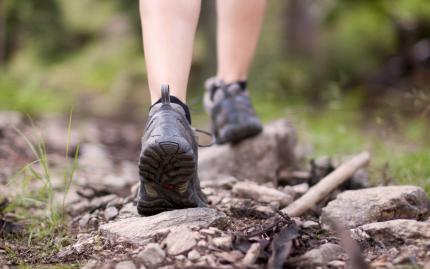 It's a great way to explore new areas, to experience the perks of a guided hike (e.g. not having to worry about navigation or transportation for that matter), and meet new people. Thanks to Discover Outdoors, I've come to enjoy the outdoors in a way I never imagined. Been a client since 2012 and have seen the company evolve and include more trips and events. I've gone on numerous day hikes to Minnewaska State Park, Catskills, Harriman State Park. I also had the opportunity to go on a multi day domestic trip upstate and also a international trip to Peru last year. That was probably my most adventurous vacation to date. DO's itinerary often includes the off beaten path trails so in Peru, we hiked the lesser known Moonstone Trail (as opposed to the more popular yet crowded Inca Trail) I have to say the experience was almost ethereal. Our group was the only group on the hike - we had company sometimes but it was mostly sheep and other animals. The trip was a great combination of relaxation (staying in hotels, sightseeing) and also lots of outdoor adventure and real camping and hiking. Regardless, most days start out early so if you're the type of traveler who prefers beach, relaxation and catching up on sleep (and access to pristine toilets 24-7), DO's international trips may not be for you. Or maybe you're down for a change, in which case, go for it! I've met some incredible and inspirational people on DO trips so not only will you enjoy the outdoors and adventure but you'll also get to meet some really great people and make some new friends. While the trips can be pricey, I feel they're almost the same or sometimes less $ than similar offerings from other companies. The guides are experienced, social and fun. Newer guides are usually paired with a more seasoned guide so sometimes you'll have two guides for one trip. All in all, I can safely say that each experience has been wonderful but with room for improvement. One area where they can improve are logistics e.g. how they handle accommodations for multi day trips and vacations. If they plan to include single supplement as an option, they should stick to it if someone selects that option and puts down the additional money. Assigning them roommates without offering a refund first and explaining or asking people to share who already paid the supplement during the trip is not great customer service. I also think they can improve their rating scale and evolve it to accommodate their ever growing array of trip types. Great! Very informative and relaxing. The tour guide was amazing. I want to give them 5 stars. I've had some experiences that range to absolutely incredible to so so-about 3 stars. It really depends on the guide you have. While all are nice , personable & responsible, some you just click with better than others. I think one of the other things they can do better, is better screening. I've gone on a number of different types of hikes with them and on a particularly strenuous hike in the Catskills, I noticed other people showed up (late) in thin sneakers with no support. Thankfully they made it through the hike, but what if they got injured? The whole group could have suffered as a result. One time, someone really out of shape went on a hike and one of the guides had to stay back and hike with this person for the better part of a day. I totally get it as things happen and sometimes people think they are fitter than they really are, but this has happened numerous times. I just think they could screen better, so I am reluctant to book an out of state multi day in the White Mountains for this particular reason. Surprise Lake, Horseback riding and wine tasting, Kayak to Bannerman Castle and Hike and whiskey tasting). There are many more trips I want to do and hopefully will. Every trip that I have done so far have been great. The guides are super friendly and try their hardest to accommodate any needs (FOR EXAMPLE: The furthest meet point was on my last trip- E 14th street. Although I left with ample time.. the MTA BLEW that morning. I had to get off at 125th st from the 5 train and catch a cab. But thanks to the popes visit... closed highways and crazy messy traffic, my sister and I were running late. But thank goodness that the guide arranged to meet us where we were (since they had to drive up north from 14th st to where we were at 72st). Went on the day hike through Harriman State Park. We had amazing views, a great pace, great variety (rock scrambles, uphill, lakeside lunch, easy path along the river bed on the way out), the best guide (Marcus), and perfect weather. Transportation was easy and on time. Can't get much better than that. The tour was fantastic! out tour guide was very informative and kept the tour interesting from beginning to end. Went ice climbing today w this group. Best outdoors club in the city!